Business Sector: Project development and construction group with expertise in building, piling and foundations, facilities management, utilities, civil engineering, mechanical and electrical engineering and highways maintenance. Skanska is one of the world’s leading project development and construction groups. The UK operation is one of the country’s top 10 contractors. In the UK, Skanska is famous for building iconic structures like 30 St Mary Axe (the Gherkin), Heron Tower, Barts and The Royal London hospitals and the QEII Bridge. Just as important are our extensive service-based contracts: upgrading London’s gas infrastructure, a wealth of facilities maintenance contracts, long-term street lighting projects, and landscaping for the London 2012 Olympic Park in Stratford. By combining our skills and experience in construction and infrastructure development, we have become a UK leader in delivering projects in healthcare, education, defence, transportation and municipal services, delivered through both private and public investment. Specialist in-house teams provide world-class foundations and piling expertise, as well as mechanical and electrical services for buildings and infrastructure. Our forward-looking approach to sustainability is expressed through Our Journey to Deep Green™, where our aim is for all Skanska projects to have a near-zero impact on the environment. Our role as a leading green developer and contractor was confirmed when our President and CEO, Mike Putnam, was invited to be Co-Chair of the Green Construction Board, alongside Business Minister Michael Fallon, in 2012. The documentation detailed above has been produced to provide both policy and guidance in relation to all driving activities including road safety. All employees who drive on Skanska business are inducted in line with the driver manuals. There are also a number of safety briefings and best practice case studies that are available on the intranet. Skanska also holds ‘stand down’ meetings in order to discuss and learn form major incidents. Skanska holds ISO9001, ISO14001 and OHSAS 18001 accreditations and is subject to rigorous audit from its internal compliance team and third party auditors. Skanska has recently been successfully audited for reassessment to FORS (Fleet Operators Recognition Scheme) and is also accredited under the FTA Van Excellence Scheme. The Fleet Operations Manager also conducts specific audits at depot level. This is an area that is currently under review in order to introduce a new robust audit regime specifically targeted at fleet related matters. 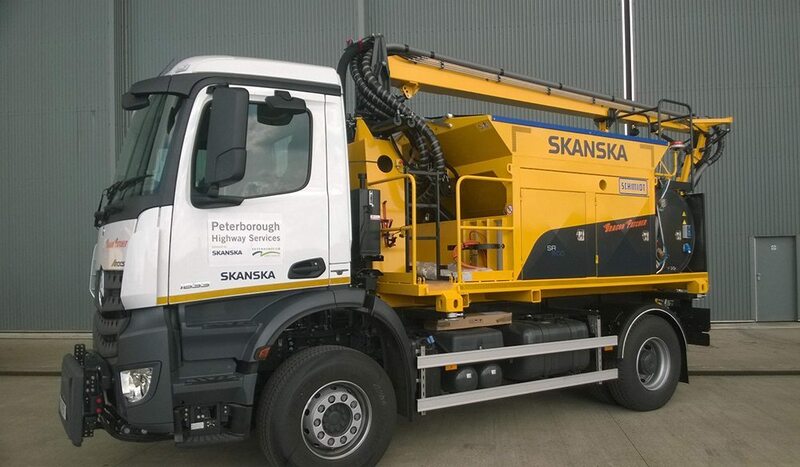 Skanska has already begun to see a reduction in the accident frequency rate, and it is important to note that the figures include both own and third party damage. The figures are provided by Leaseplan who act as Skanska’s accident management company. Although there is still a huge opportunity for improvement, the statistics do show an overall 8% reduction in AFR between 2010 and 2012. 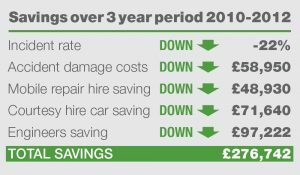 Implementing telematics into our commercial fleet has resulted in a reduction in both the number of collisions and the size of our insurance premium. Less expected was that one of our first contracts to use telematics has also shown a 10% reduction in fuel usage between January 2016 and March 2017. However, while telematics can deliver great benefits, it is important to remember that managing and acting upon the data is essential to maximise these savings. Fleet safety has always been important, but we have learned that it needs to be a living breathing part of the overall safety culture of the business. Our drivers are already skilled and know how to drive safely, but they sometimes chose not to. Changing driver behaviours is the only sustainable way to improve the culture long term. Skanska has recruited a Fleet Road Risk Manager to lead a dedicated team and further develop on the work achieved so far in relation to road safety. Issues arising from audits including driver’s hours, defect reporting, and completion of identified training. Skanska’s Fleet Road Safety Manager will attend senior safety team meetings and engage with health and safety teams, to extend the strong safety culture that Skanska has to all aspects of driving for work. The fleet department is establishing a new robust auditing system focusing on the vehicle/driver/journey aspects of the business. This will work in addition to the existing audits and enable the process to add real value to our fleet operations. Contract champions will be identified to ensure a consistent approach throughout the business. Skanska is going to be part of the new ‘Fleet Safety Forum’ put together by IOSH. Skanska has a strong safety culture and holds numerous awards from ROSPA, British Safety Council and specific industry sectors. Skanska holds the following fleet-associated accreditations.